His and Hers outfits for the most anticipated date-night of the year! The most anticipated date-night of the year is FINALLY upon us: Valentine’s Day. Now, there may be some guys and girls who are STILL scurrying for last minute gifts, reservations (oops! ), and bouquet arrangements — it happens! But, if there’s something that doesn’t belong in the infamous Last Minute Club (yup, I made it up just now, and you can shamelessly jump on board), then it has to be your date-night outfit. Or, should I say outfitS? Valentine’s Day is a time to celebrate the love you share with your partner. It can also be a great way to show the world the love the two of you have for fashion! This year, I encourage all couples to go the extra mile and have your outfits complement one another’s for a night on the town — just don’t step out in matching bright pink leotards! In case you’re strapped for ways to bring together the perfect His & Hers look, I’ve got you covered. 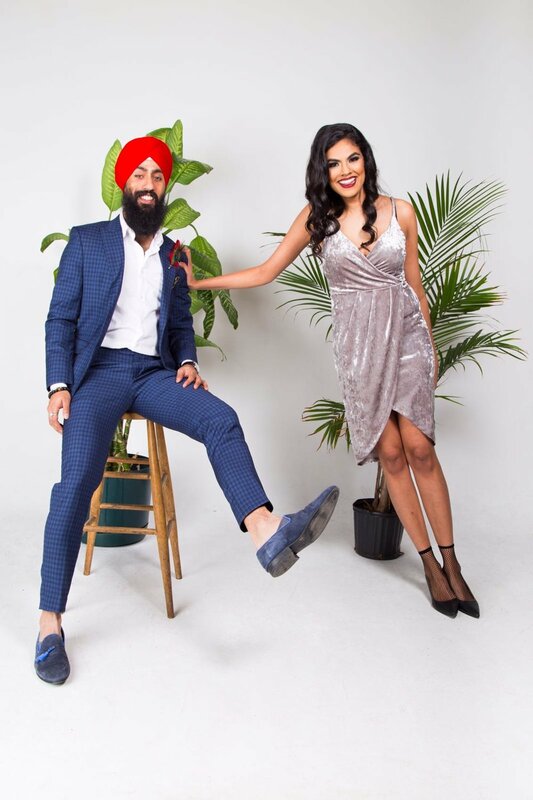 It’s so easy to play with colors, cuts, and accessories when figuring out how to deliver total #couplefashiongoals, and here’s a bit of inspo to get you started. Solids don’t have to be boring, nope! A deep green dress never looked so good with a berry lip and gold accessories. Now, add in that purple pugh (turban) and blue vest to the mix and you’re a match made in heaven. The earth-like tones are a good way to add newness to Valentine’s Day which is usually all about the pinks and reds! The best part about these ensembles is the simplicity — carry them with poise and grace. Your Valentine’s Day doesn’t have to be complicated to be noticed! With velvet being all the rage, the leading lady in your life can’t go wrong with a tulip cut dress in this cozy-yet-classy material. The beige is the ideal color to pair with a vibrant red lip to give you all the rosy and rouge Valentine’s Day feels! The blue checkered suit for the men makes for a win-win situation. The checkers add the perfect dimension to what can be an otherwise plain coat and pant. The red pugh (turban) adds a firey touch, and not to mention the ultimate accent accessory: the peacock feather. Both are dressed to the nines and there’s no regret about it! Don’t have a peacock feather? Don’t sweat it! Red pocket square and a matching red lapel pin a timeless and classy alternatives! Look 2 - Velvet? Check!